This attractive pasta bake may take time to prepare but it is well worth the effort, and can be made well in advance. 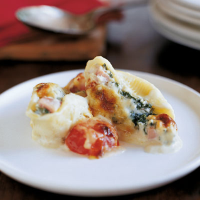 It's also a great way to use up your Christmas ham or gammon leftovers. Preheat oven to 180°C, gas mark 4. Place the tomatoes in a small roasting tin, drizzle with the olive oil and season well. Shake the tin to coat the tomatoes with the oil. Cook in the oven for 20 minutes until the tomatoes are soft but retain their shape. Meanwhile, place a large saucepan or stockpot over a high heat and add the spinach. Cook for 2-4 minutes, stirring often, until it wilts. You can do this in 2 batches if you don't have a large enough saucepan. Drain and transfer to a large board to cool quickly. Once cool enough to handle, squeeze or pat dry, chop, then put into a large mixing bowl. Add the ricotta, ham, nutmeg, half the Parmigiano Reggiano and season with black pepper. Beat to combine. Cook the pasta shells for 10 minutes in a large pan of gently simmering water. Drain and spread across a large board to prevent them from sticking together. When the pasta is cool enough to handle place a heaped tablespoon of the filling into each shell. Don't worry if some of the shells have torn, you will be able to use most of them. Spread 200g of the cheese sauce over the base of a large baking dish or roasting tin. Place the filled shells on top, filling side upwards. Add the tomatoes, on and under the shells. Heat the remaining sauce according to pack instructions, then pour over the top (see left) and sprinkle with the rest of the cheese. Bake in the oven for 1 hour until bubbling and browned. Fill the pasta shells up to one day before cooking, and keep in the fridge until then. To save time, replace the filled pasta shells with a 500g pack of Waitrose Rigatoni. When you reach step 4 stir the pasta into the ricotta and ham mixture, pour into the baking dish, add the tomatoes and cover with the cheese sauce.